Elves are mythical and magical creatures in many forms of fantasy literature, and nowhere do they receive more attention than in J.R.R. Tolkien’s writings. Tolkien’s Elves are powerful beings, whose grace, beauty and skill are all too often overshadowed by their hubris. Elves are mythical and magical creatures in many forms of fantasy literature, and nowhere do they receive more attention than in J.R.R. Tolkien’s writings. Tolkien’s Elves are powerful beings, whose grace, beauty and skill are all too often overshadowed by their hubris. The Elves fight against the Dark Lord for a millennium, sometimes winning decisive battles, other times bring brought to the brink of extinction. Only their strength that burns in their hearts seems to help them carry the day; their strength and the weapons of power that they create. 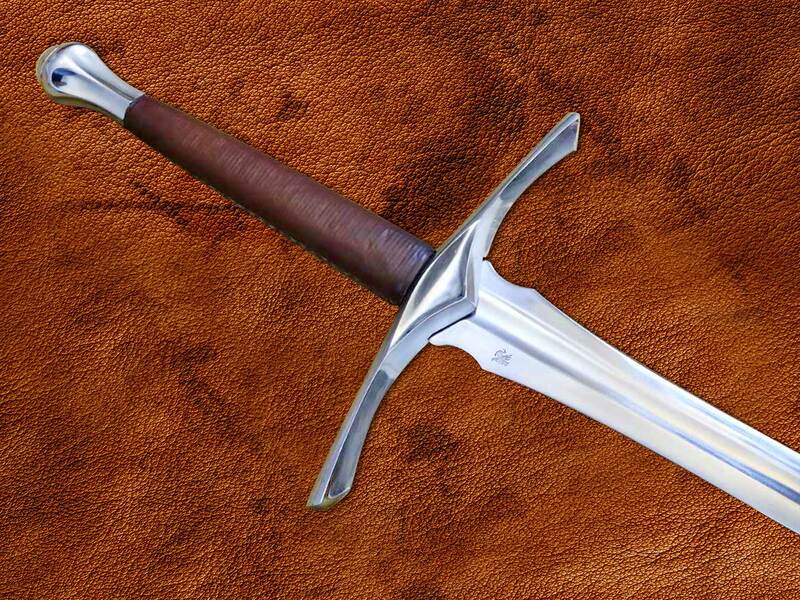 The Sage fantasy medieval sword was crafted with Tolkien’s realm in mind. Middle Earth and the battles waged for the safety and respect of all living being. This philosophy was maintained during the creation of this battle ready sword. The smooth and subtle curves of the blade, guard and pommel were meant as a reflection of wisdom and understanding while the downward looping guard flows towards the curves of the blade in a form of dance between both parts. Despite this seemingly fragile aestheticism, this medieval fantasy sword is nothing but stern. It’s 2″ wide blade delivers destructive cutting blows with a very sharp tip, leading to equally devastating thrusts. The Sage fantasy sword is not only an eye catcher, it is also a definite force on the battle field. 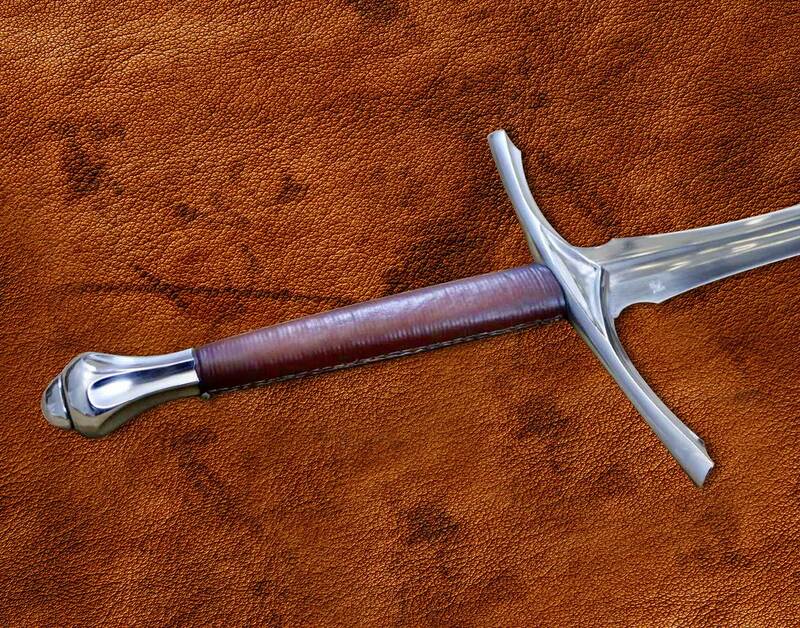 As with all our battle ready swords, the Sage is hand forged with 5160 High Carbon Steel. The blade has been dual hardened. The Tang of the blade has been hot peened over the pommel. Received much quicker than anticipated. Great sword in terms of pure beauty and practical use. However two things I must address are that well I ordered the edge sharpened it did come with an edge which while not overly sharp it is able to cut and the tip of the sword is also properly sharp . And this is best used for light cutting, what I mean by that is no hacking hard wood or metal targets with it. Its point of balance is where it is said to be on the site and that combined with its weight definitely make this a two handed sword. The scabbard fits the blade nicely and while it is snug the blade will fall out if turned upside down but not immediately. The one gripe I have is not major and that is there is a small bit of glue visible where the hilt and cross guard meet but I am totally cool with. Overall great buy everything the site says was correct so if you’re a fan of the Lord of the Rings and want a beautiful as well as practical sword I would highly recommend this.